Facebook is known as the biggest social media platform today. Companies use it for virtually anything. It serves as a cheap support platform, offers advertising opportunities and generates brand exposure like no other website does. But times are changing and Facebook has reached a level at which it has trouble growing further. Over the last couple months we noticed that more and more users lost interest in having business-customer conversations. So we dug a bit deeper. Our thesis: The amount of user-posts drastically decreased. 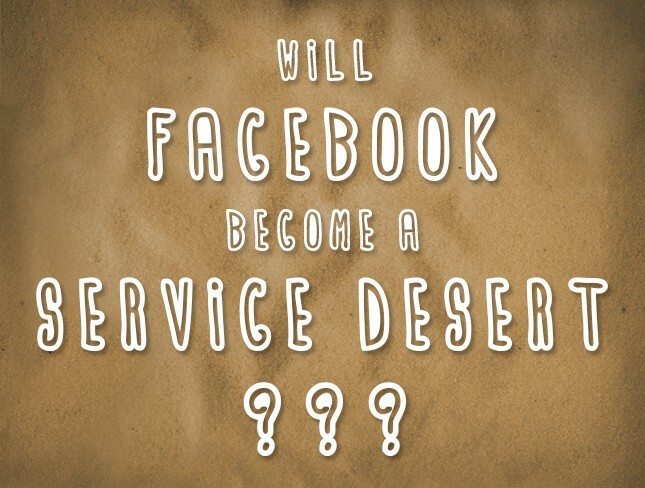 Is Facebook still useful as a service platform? Our analysis will show that it isn’t always easy to tell whether or not something is successful. There might be more users to talk to, but if you can’t reach them then the fact that they exist is irrelevant to your cause. We analyzed more than a thousand international pages. Airlines, fashion labels, consulting agencies and TV stations, just to name a few of the represented industries. We analyzed the development for every single one of them separately. First we are going to have a look at the overall development. Every single page is part of the sample. The results were staggering. Over the course of the last 12 months we noticed a loss in fans. While the average page had around 2.26 million fans in April 2014, it shrunk to 2.04 million in May 2015. This has to do with Facebook getting rid of fake users, which made pages like Starbucks lose over a million users. Every industry lost user-posts. Fans are leaving Facebook behind. Another reason might be the decrease in posts. There are only two industries that didn’t publish less content: TV stations (+25%) and supermarket chains (+/- 0%). All others posted significantly less often. Especially candy manufacturers (-36%) and fashion labels (-32%) tried very hard to save resources. Cutting a third of your content is definitely something that will do that. User-posts are next. TV stations took the biggest hit. More than 52% less user interaction. You might wonder: What is the point of posting content if it doesn’t result in more attention? Well, the problem is the overall volume of posts. In 2014 TV stations published 4.4 posts per day. That’s quite a bit and might be considered as spam by a vast amount of people. In 2015 this number increased by 23% (5.6 posts per day). Passenger airlines post 7% less often and only lost 2% user-post. Low cost airlines performed similarly. 2% less posts, 12% less user posts. 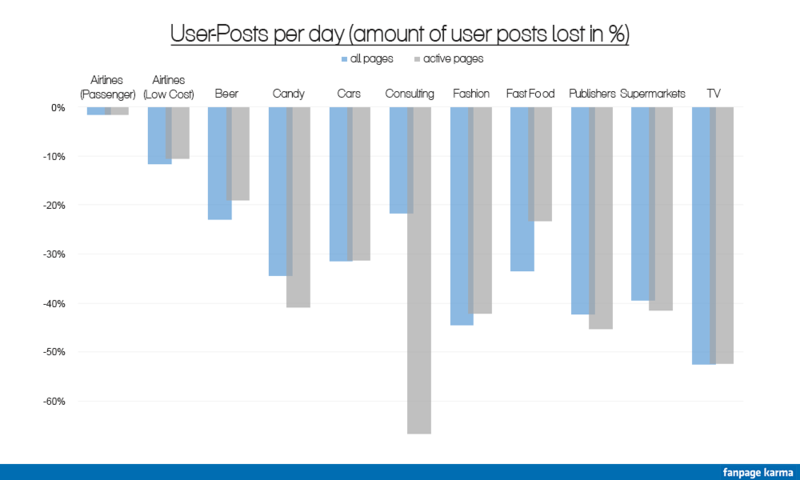 Overall, 36% of all user-posts were lost. Which means 36% less business-customer-interaction. To see if inactive pages are the reason for this development we created a ruleset that a page had to fulfill to be stay part of the sample. Rule 1: pages were required to have been active in both 2014, as well as 2015. That means at least 0.5 posts per day. This might seem a bit low but different industries have different standards. A consulting agency won’t bomb their users with half a dozen posts per day. A newspaper might. Rule 2: pages were required to have an active user base. To be a bit more precise: more than 0 user-posts in April 2014. The more active a page used to be, the less user-posts it lost. The only exception are TV stations who are basically spamming advertisements. This changed things slightly. Active pages are more likely to have a growing fan base than inactive ones are. Instead of losing 10% of their users, they gained 13%. 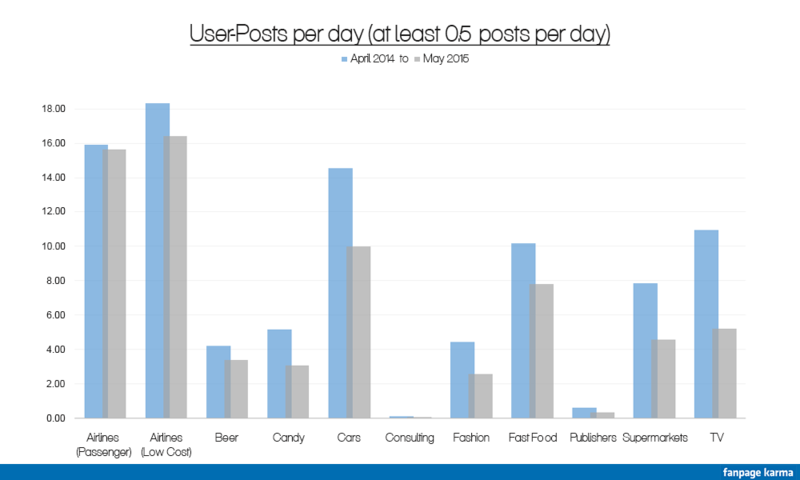 A bit over 8% more posts published per day. However, users still lost the interest in the conversation. Almost 32% of all user-posts were lost. Being active didn’t save you from losing your customers attention. The results almost seem to be mirrored. Consulting agencies are the sole, outstanding industry. 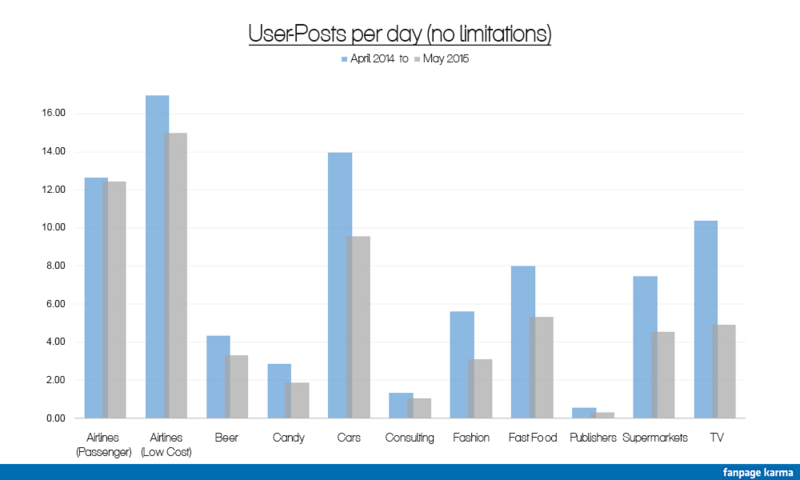 Overall, the industry lost 22% of its user-posts. However, active pages lost a stunning 67%. This might also be a result of them posting 39% less often. Yes, they used to be active and still are (at least by our definition), but if you reduce the amount of daily posts from 0.92 to 0.56 then your fans are obviously going to pay less attention to what you have to say. International pages lost even more user-posts than German ones. But what’s the reason behind this development? Why do so many users leave? One explanation is the bad service level. Over the last 12 months less and less users had their questions answered. A whooping 12% less users got a response. TV stations reacted to 34% less user-posts, which is another reason why they received significantly less of them. If I don’t pay attention to my fans then why would they want to start a conversation with me? Pages might respond quicker, but being quicker doesn’t mean that you’re being quick. In April 2014 the average response time was 31h. Over the last year it almost halved (2015: 17h). This is a step in the right direction but still not good enough. Being forced to wait almost an entire day for a response is not acceptable. Especially since most questions are rather simple. Active consulting agencies tried to save more resources than anyone else. The reward: two thirds of their user interaction gone. To summarize: Less than half the users get a response and even if they are fortunate enough to receive one they still have to wait an entire day for their question to be answered. Another reason is the constantly growing competition. Pinterest and Instagram have become the go-to platforms for fashion labels. Their layouts and functions are more limited, but still good enough to promote clothes and various other products. Both platforms make sharing pictures significantly easier and enjoyable. And then there’s Twitter. Probably only a few people anticipated that this platform would ever grow by such an extent. Especially companies who put a high value on customer support consider it their bread and butter. On a normal day, low cost airlines tweet 87 times. The vast majority of these posts are part of conversations (88%). A year ago both figures were significantly lower, reaching 61 and 73% respectively. This development is a double edged sword. On one hand feeding and administrating multiple social media platform is more expensive, therefore bad. On the other it shows that users aren’t just leaving. They are adapting, choosing the platform that caters to their needs. Paying attention to all of them becomes a must or else you end up ignoring a large portion of your potential user base. Facebook is losing exposure. Social Media however isn’t! Facebook, Twitter, Pinterest or Google+. Fanpage Karma has it all. Try it for free!